I just read a post on another travel site with the term “Minimalist Travel” in the title. My first reaction after reading the article was “Nooooooo!”. This person thought that traveling with a carry on bag and a large personal item was minimalist! I think that most experienced travelers would disagree with their assessment. It came across as a little clueless. Carry on? Check. Light? Maybe. Minimalist? No way. I applaud that person’s ability to travel lightly, but it wasn’t minimalist. It did raise the question though – what is minimalist travel? Small, smaller, smallest. Progressing from a full sized carry on bag to a smaller under-seat bag. The bag must fit within most budget airline carry on limits. That allowance is all you get. The allowance is usually a single carry on bag, weighing less than 7 kg. Some airlines have a smaller allowance! Some airlines charge extra fees if you can’t put your bag under your seat. That means that a true minimalist must travel with an under seat bag. Hey, you won’t have to worry about overhead bin space. Freedom! Under seat bags are limited in size. You’ll need to stay under 26 Liters if you want your bag to fit. So let’s make 26 L the upper limit on bag size. No special travel jackets (unless you are traveling without a bag). Special jackets and vests get hot and heavy after a few hours. You can’t dump them and leave them behind because you need them for your extra gear. You can’t stuff the packed jacket into your luggage. The jacket becomes a liability on your travels. It’s one thing to temporarily stuff gear into your pockets to make a weight limit. It’s quite another if you have to wear your special jacket the entire trip. That’s a burden. You can run with your bag. If you can do that, you are truly traveling light! In summary, a true minimalist would travel with a single bag no larger than 26 liters and weighing no more than 7 kg. Minimalism isn’t required for light travel. I want to encourage everyone on their quest to pack as lightly as possible. Make no mistake – getting all of your gear into a carry on bag is an achievement all by itself. That said, I would like to reserve the term “minimalist” for those that have truly downsized. After all, we all need a goal for the next trip! What do you think of the term “minimalist travel”? Is it overused? What guidelines would you suggest? Totally agree! I travel carry-on only (suitcase plus personal item), but in no way do I consider myself a “minimalist” traveler. And I also share your viewpoint on those crazy travel vests and travel jackets, for exactly the reasons you mention. Oh the freedom of one bag travel – truly one bag, not a roller and a personal item. This type of posting is spot on for me and a great encouragement to continue to refine my capsule. My goal is to keep to one bag and for that bag to be manageable. I’m not at the under the seat size, yet, but that is certainly a possible goal for this year. I always enjoy your posts, thank you. Excellent points – I love carry on only with one bag but so far 30 liters is smallist I have managed. Lovely to have you posting again. Agree with your definition, especially when it comes to international travel, where the definition of ‘carry-on’ is often much smaller than the US domestic definition, and much lighter too! I also think that getting to that definition is a process. For me it was a process of letting go of the ‘just in case’ mindset, which was largely responsible for my large bags of years past. Once I found that I didn’t need X, Y, or Z, or that I could easily buy, borrow, or MacGyver what I needed on the road, my bag became much, much smaller! You’re definitely correct calling it a process. It takes time and many experiences to figure out what does and doesn’t work for you. Many times I see a Dunning-Kruger effect with newbies. They don’t know what they don’t know. That’s why I think it’s important to define what is and isn’t minimalist travel. I thought that the other website was misleading when it labeled two bags as minimalist. I just started a blog myself on “minimalist travel” and my definition is the same as yours! Except my bag is 30L and 4.5kg but I leave extra space for snacks and souvenirs:) I am obsessed with packing less and less so maybe I’ll end up with just the clothes on my back soon! Thanks for your post. For me, minimalist travel is just one bag total. I’m obsessed with weight. I’ve just written a post about my progression from a 40 liter carry-on to a 20 liter daypack for long term travel. I love your site! So much excellent information here; thank you. 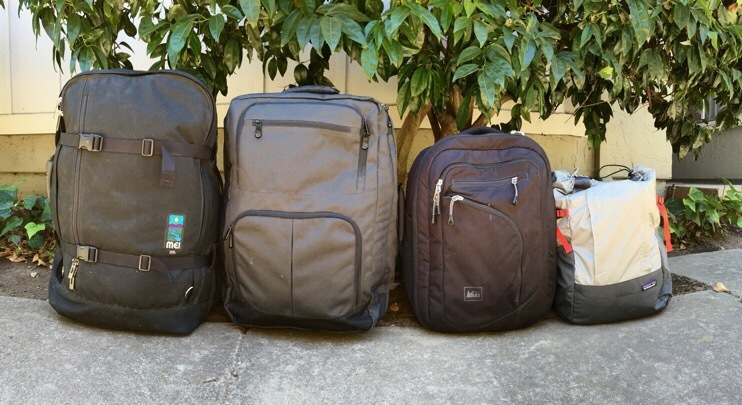 Since 2010, I’ve been travelling with carry on luggage only – and recently started blogging about my experiences at Planepack – https://www.planepack.com.au – for an Australian viewpoint on travelling and flying light!